The UDS 801A/C auto calling unit is a highly reliable, superior performance dialer. The ACU accepts parallel or serial command inputs, and dials with either pulse or tone signals. Data rates of 75 to 9600 bps are accommodated in the serial mode. The ACU interfaces with three components of the system: the data terminal or computer equipment (DTE), the data communication equipment (DCE) or modem, and the telephone line. Two possible interface configurations exist: 1) ACU with parallel input which requires RS-366 and RS- 232 ports on DTE; and 2) ACU with dedicated RS- 232 input which requires two RS-232 ports on DTE. Installation of the 8OIA/C is easy and operation is straightforward. Built-in manual testing allows the user to verify correct operation and to dial the last stored digit. An internal switch allows for the selection of either pulse or tone dialing or automatic determination of dial mode. In the auto mode, the 8OIA/C will first attempt to dial using standard touch tones. If the dial tone remains, the 8OIA/C will automatically switch over to pulse dial and complete the call. The internal switch also allows calls to be made directly in pulse or touch-tone mode without the automatic test of the line. An integral speaker allows the user to audibly monitor call progress for dial tones and busy signals. 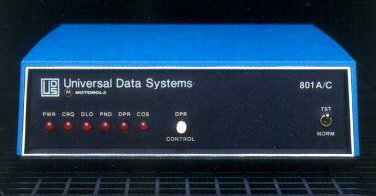 The UDS 8OIA/C standalone automatic calling unit may be ordered as an interchangeable standalone/ rack mount unit. Simply remove the plastic cover from the standalone enclosure, remove the ACU card, attach the optional rack panel, and insert it directly into the RM-16M rack. With this feature, a DataComm facility can easily upgrade from multiple standalone enclosures to a centralized rack without th-2 expense and trouble of purchasing new ACUs or modems. Additionally, a single 8OIA/C stand alone enclosure may be mounted in standard 19' equipment rack via the UDS model RM IM rack adapter. Two units may be mounted using the RM2M rack adapter.